After the war and into the 19th century, Prospect Hill returned to a peaceful life of agriculture. The Munroe family maintained a grist mill near the summit, and the Tufts family owned a large estate just to the west. The town of Somerville was born in 1842, and in celebration 100 guns were fired from Prospect Hill. Around this time the first houses were built on the hill by grain dealers Robert Aldersey Vinal and Robert Munroe. Other wealthy merchants and real estate speculators bought large tracts of land on the southern slope of the hill, then subdivided them, hoping to quickly resell the land for a profit. But the hill remained generally unoccupied until the 1850s, when there was a burst of immigrants coming into Boston, and when the horse-drawn streetcar started coming to Union Square. Gradually, rural farmland was transforming into a working suburb. As the Civil War began in 1861, Prospect Hill was used as a training camp, while Union Square (its name changed from Liberty Pole Square in support of the Union) served as a recruitment center. On the hill, soldiers raised a flagpole in the same location as their revolutionary ancestors. The real transformation of the area occured after the war. The Somerville Journal declared in 1870 that "Prospect Hill will ultimately be the most aristocratic and fashionable place in the suburbs of Boston." There was even talk of building a summer hotel on the hill. To improve the area, the city decided to fill in the polluted Miller's River running near Union Square. To do so, in 1874 they chopped off the top of Prospect Hill to use for filler - a common practice in Boston around this time. Ten feet of the 125-foot hill was carved away, though a small section of the original elevation was retained. With Union Square becoming the commercial center of Somerville, a house-building boom began in the 1870s and continued into the 1900s. Somerville's population, 14,700 in 1872, grew to 69,000 by 1900. Prospect Hill became a popular location for prominent families to build large, single-family homes. These were typically provision, grain, or leather dealers or merchants who commuted to Boston by horsecar and train (and later by electric streetcar). In the midst of all this Victorian development, the spirit of conservation arose among many residents. Starting in the 1870s, the Prospect Hill Improvement Society and other civic improvement groups started lobbying to preserve the hill and build a park to commemorate its historic role. In the 1890s, the Prospect Hill Park Association formed and sent a petition with over 500 names to City Council to argue for a park. 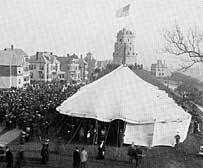 In 1898, the new Somerville Historical Society held a "Historic Festival at Ye Foot of Prospect Hill" to increase public awareness. These preservation efforts paid off in the new century. The city bought the land for the park (then containing two houses) in 1902, and built a 42-foot granite tower to commemorate the hill for future generations. The structure, which cost $8700 to build, was dedicated on October 29, 1903. A tablet inside reads: "This tablet is erected in memory of the soldiers of the Revolution and of the Civil War who encamped on Prospect Hill and of the banners under which they valiantly fought." Since its creation, Prospect Hill Park remains relatively unchanged. In 1955, unfortunately, concrete retaining walls were installed around the tower, apparently to address erosion problems. Currently, the tower is in need of repair and restoration; a recent report estimated it would take $400,000-$900,000 to reburbish the structure. Every year on January 1, Somerville residents gather on Prospect Hill for a ceremony commemorating the historic flag raising. In this peaceful suburb so close to Boston, we still remember the importance of this hill in the birth of these United States.